In 1933 Kiichiro Toyoda started automobile department in the loom factory of his father. Before establishment he visited the many automobile plants in U.S. although in japan there were already ford and general motors but Toyoda was succeeded in incorporating Toyota Motors Corporation on 28th August, 1937. Now a day Akio Toyoda is the president of Toyota Motors Corporation. Current market share of Toyota Motors Corporation is 9.8% of the global market. Toyota Motors Corporation was prompted to develop fuel efficient vehicles because japan has very few and limited natural resources. Moreover political environment prompted not only Toyota but also other manufacturers to develop new technologies. Toyota Motors Corporation focused on manufacturing small and fuel efficient vehicles but others manufacturers remained busy in producing luxury and large vehicles. This attitude helped Toyota Motors Corporation to get higher position than others. Since 1940 Toyota Motor Corporation has played well in the competition among other producers of automotive industry. This success is due to its unique culture and values and combination of other different factors. That is why Toyota Motor Corporation is still growing as leader in automotive industry with more than 5 million per year vehicles and 333,498 employees. Toyota Motor Corporation is a public company and its head office is in Japan. However as international organization its operations are in the all over the world. Its operations are almost in every continent as can be seen in the figure like Australia, Asia, America and Europe. There are numerous environmental components which can and does impact the Toyota Motors Corporation. These elements incorporate environmental change and waste handling. 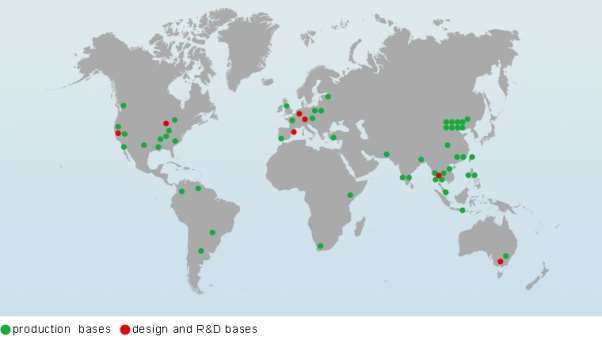 Atmosphere is exceptionally critical which impacts the activities of Toyota Motors Corporation. Environmental change impacts not just the production but also on the health of labours and other workforce. As production relies on the atmosphere so if atmosphere changes then production will change. An alternate environmental element is the production of waste and administration of this waste. It is exceptionally imperative issue it can bring legitimate issues so it ought to be acknowledged with extraordinary necessity.. For the waste management Toyota Motors Corporation is using TPS (Toyota Production System). In this system there is concept of "Muda" which means to eliminate waste. It covers every kind of waste i.e. waste in transportation, waste in production and waste of movement and defective products. Another environmental factor which can move the Toyota Motors Corporation is use of natural resources. As for the production Toyota Motors Corporation is using the natural resource of country in which it is operating, so as result shortage of these natural resources can draw some negative impacts. For example use of water or energy sources is major issue. As it has operations in many other countries so it has to follow the applicable laws. Not only laws it has to follow and respect the cultures, norms and values of each region. There are some factors which affect the operations of Toyota Motors Corporation like conflict of interest, compliance with laws and regulation, reputation, relatives and families. All these factors are of quite importance. It is very critical to comply with the laws both at national level and international level. After Second World War automakers of Japan, including Toyota Motors Corporation, knew that government protection, import duties or other limitations, is not enough for the business. Anticipating the increment in international trade japan, in 1955, joined the GATT (General Agreement on Tariffs and Trade). The real competition began when in 1965 Japan allowed the import of cars. For smooth operations it is necessary that all local laws are followed otherwise legal issues may arise. Sometimes due to operations, or other issues like mismanagement of waste goodwill is hurt or reputation of organization gets affected. In such case it is necessary to get the people convinced and regain the goodwill of organization. Another factor is conflict of interest which can arise in the course of operations due to different reasons. In such case Toyota Motors Corporation resolves the issue for the benefit of Toyota Motors Corporation. A benefit to relatives and families is another issue which often arises in the life of organizations. It means giving employments to only family's members or relatives. Understanding, monitoring and adapting to the political environment is absolutely essential for the business of Toyota Motors Corporation because it significantly affects every aspect of their working. Political instability can cause wars and military actions which will make difficult to find the material necessary to manufacture the cars. Toyota Motors Corporation faced the similar situation during Second World War. Due to war situation Toyota Motors Corporation was compelled to manufacture recycled cars and other vehicles. First of all stability of the government is very essential for smooth operations of Toyota Motors Corporation otherwise law and order situation will not support to carry on the business, besides this type of government is also important factor whether it is monarch or democratic. Political situation also includes the policies of government for development of its economy. Toyota Motors Corporation's business depends a lot on the policies of govt. If policies are lenient and supportive to business then business of Toyota Motors Corporation will flourish and if policies are strict then there will low trend in the business. Taxation policies are also relative regarding the business in any country. Similarly trade policies can also affect the business of Toyota Motors Corporation. In surrounding countries diplomatic events can also influence the activities of Toyota Motors Corporation, because these events determine the future. There are different cultural factors which can influence the activities of the Toyota Motors Corporation. These factors include regional language, regional values and traditions. For smooth operations it is necessary to respect the cultures of others. Otherwise people will have negative image about the Toyota Motors Corporation. Language issue also matters a lot because to convey message it is must that communication should be in such a language which is understandable to all and also there should be local people who have employment in the Toyota Motors Corporation. Any activity which is against the local culture then it would be really difficult to survive for longer period. Similarly in cultural factors there is another important factor which is religion. Religion is such a vital factor which if ignored can destroy the business. Religion determines the attitude and behaviour of people in the working environment. There may be more than two or three religions' people, so in such cases Toyota Motors Corporation should be careful that whether it's any decision is offensive to any clause of any religion. Social factors play an important role in the business of any organization. Therefore Toyota Motors Corporation activities also depend a lot on these factors. Social factors include population, age distribution, employment level, education, income level and common beliefs. All these factors affect the activities of Toyota Motors Corporation. For example age distribution determines the nature of products and range of products. Age distribution is the determinant of these products like vehicles, because at the age of employment young and old need conveyance so demand for cars increase. Employment level and income level determines the buying behaviour because purchasing power depends upon these two factors. Education is another vital factor which can affect the mentality of people; their attitudes towards products can affect the business of Toyota Motors Corporation. Similarly common beliefs of people determine the sale of products. Due to any reason including invention of alternative then sustainability of Toyota Motors Corporation will be in danger zone. Economic factors include changes to an inflation rate, interest rates, taxes, exchange rates and excise duties trading regulations. For operational efficiency Toyota Motors Corporation is need to consider some other factors. These factors include skills levels, unemployment, wage patterns, availability of expertise, labour cost trends working practices. For the purpose of determination of the economic feasibility of a market Toyota Motors Corporation considers some other factors like the current cost of living for its target market. Toyota Motors Corporation also looks for the facilities like availability of finance and credit. As Toyota Motors Corporation is a multinational organization which is currently working in almost every continent, so it is very important for it to consider the market for its products. In this regard it considers the combination of different factors for the selection of market. Asia is very rich in population so it is very big market for its products. Toyota Motors Corporation makes strategies of the marketing according to different factors which include social and cultural factors (religion, language, religion, age distribution, and income level), political factors, technological factors, international factors, globalization, business cycle, geographical factors and ethical factors. If these factors are not focused then Toyota Motors Corporation will have to bear the loss of lost market share. Toyota Motors Corporation considers the economic factors before making strategies like globalization, embargoes, trade tariffs and taxation policy. High inflation rate in economy affects the business of Toyota Motors Corporation adversely because high inflation rate will decrease the purchasing power of people. Hence sales of products will decrease. Market's growth rate and the confidence of market in the economy are other determinants of strategies which are focused by Toyota Motors Corporation. Some economic indicators like Gross National Product (GNP), Gross Domestic Product (GDP) and consumer based indices because these are official and present true and fair situation of economy which helps the organization to make strategies accordingly. Technological factors have potential impact on the long term strategies and operation which can be critical for Toyota Motors Corporation in future. Advancement in technology comes very rapid due to research and development and often comes so rapidly that source of development remained undiscovered. In such circumstances it is very necessary to focus technological factors. These factors can be divided into two categories; first is related to production of vehicles and second is infrastructure. Change in technology regarding production of cars, it may include improvement in parts of machine, software, procedures of production due to improvement in techniques. Change in technology regarding infrastructure may include outsourcing, research and development, total quality management and knowledge management. To remain in the market and for going concern it is very necessary for production to run its research and development department efficiently. If Toyota Motors Corporation doesn't keep pace with changing technology its sustainability will be in danger. Moreover the opportunity produced due to this gap will be availed by new entry or rival organization. International factors are also of great importance which can affect the operations of Toyota Motors Corporation that would be critical for long term planning. These factors include the international economic trends, labour laws, capital, labour wage rate and factors of production. These factors can affect a lot in terms of going international. As Toyota Motors Corporation is an organization whose operations are in different countries so it should consider these factors. Overall economic trend and business cycle affect the business in worldwide so before making strategies it is necessary to focus on these factors. Some other factors are movement of capital because there may be some restriction on the movement of capital, besides this there may be legal issues regarding use of factors of production. For smooth operations the main resources which Toyota Motors Corporation is required to have are finance resource and human resource. Availability of finance and credit is an important factor which ensures proper cash flow management and day to day activities and meets running expenses of the Toyota Motors Corporation. Human resource is a vital and very critical factor. It should be available and it should be efficient otherwise Toyota Motors Corporation will not be able to compete in the market. Machineries will be useless if there are not skilled person to handle these machines. Hence an effective plan for recruitment should be developed so that skilled human resource can be hired. Human resources not only perform the activities and run operations but also do research so that further development can be made, and this research cannot be done without efficient human resource.